Hi! 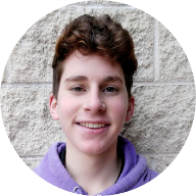 My name is Ezra Ruderman and I am currently in my Junior year at Yavneh Academy of Dallas. I’ve always found mathematics an extremely interesting, universal language that’s valuable regardless of profession. Currently, I’m studying Pre-Calculus and Statistics this year, these being my 4th and 5th mathematics courses respectively, that I have taken at Yavneh in my first three years here. As I look towards college and more generally my career, I hope to pursue my passion in Finance and Management. The Jewish High School Math League has given me the opportunity to use my talent for business to help other people, specifically contributing to an organization dedicated to another one of my passions, mathematics. JHSML is a great way of helping young Jewish teens foster a love for mathematics, and I wanted to do my part in helping this international origination using my skills in finance and previous fundraising experience. As everyday life becomes more technology-based, mathematics will become increasingly relevant. My goal in accepting this prestigious position is to help fellow teenagers develop a passion for math and join us in working towards creating a better, more efficient world.